The Tefal IXEO QT1020 ironing and steaming device promises you ultimate convenience, but does it also get results? Tefal has launched the first all-in-one iron and garment steamer. It says the new IXEO QT1020 will make it easier than ever to keep clothes crease-free. But does the Tefal IXEO really give you the best of both worlds, or are you better off sticking with a regular iron or steamer? The Tefal IXEO QT1020 is available now for around £290. This is pricier than your average Tefal steam generator or garment steamer, but cheaper than buying them both separately. It has a handy in-built ‘Smart Board’, which means there’s no need for a separate ironing board. We tried it out to see if it’s as good at tackling creases as a regular iron or steamer. Keep reading to see how its specs compare with its rivals, and when you’ll find a garment steamer handy. Want to know if you should buy this all-in-one model? Find out what happened when we tried it out – see our Tefal IXEO QT1020 review. How does the Tefal IXEO QT1020 work? The Tefal IXEO is an iron and steamer in one. 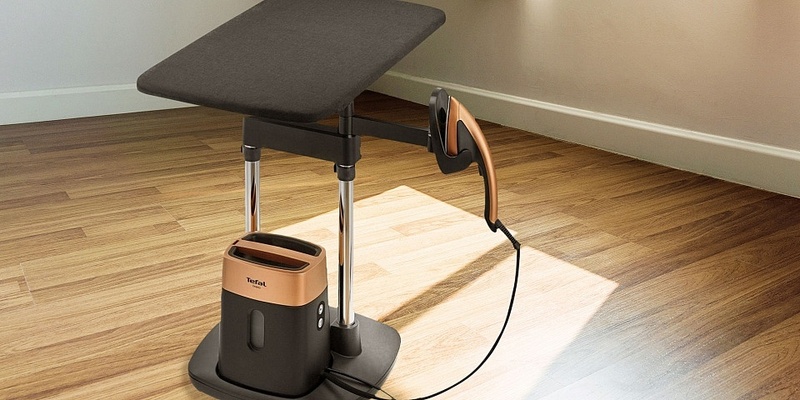 It includes an adjustable, in-built ironing board that can be positioned vertically for steaming, or folded down horizontally for traditional ironing. To steam clothes, you can clip them directly to the upright board or attach a clothes hanger to the built-in hook. You can then use the iron as a steam hose by pressing the steam-boost button, as you would with a regular garment steamer. When you want to iron, you simply flip the board down to a horizontal position for an instant ironing board. As an iron it works in a similar way to a steam generator iron, using a separate one-litre water tank. So the iron itself is lightweight and won’t need refilling as often as a regular iron. Like many steam generators, it uses ‘one temperature’ technology to iron on all fabrics, so there’s no need to worry about adjusting the temperature or scorching your clothes. The specs aren’t quite as impressive as you’d expect from a premium steam generator or garment steamer. The soleplate is small, so it’s likely to take a little longer to cover the same area. It’s missing the water-spray function that most irons have. The water tank is also on the small side compared with most steam generators or upright steamers. At five bars of pressure, it’s at the bottom end of the scale in terms of power, too. Best steam irons – find out which make ironing quick and easy, and which make it more of a chore. Garment steamers are sold as a way to quickly freshen up clothes on the hanger without having to set up your ironing board. a bulkier standing machine with a separate water tank. Garment steamers can be tiring to use and aren’t generally as powerful as irons, so they’re not ideal if you have a big pile of ironing to do or want to tackle deep creases. They’re also not great at the details, so you won’t get the crisp edges or smooth pockets you’d get with an iron. However, garment steamers are much gentler on fabrics and come in handy for situations where you can’t use an iron, or don’t want to. We’ve tried out popular garment steamers – see our garment steamer reviews to find out which got rid of creases with the least effort. A garment steamer is a great alternative if you don’t have space to set up an ironing board. Handheld steamers, in particular, take up hardly any space. While irons will burn or melt some fabrics such as silk or wool, garment steamers use a gentle enough heat that you can use them on most fabrics. 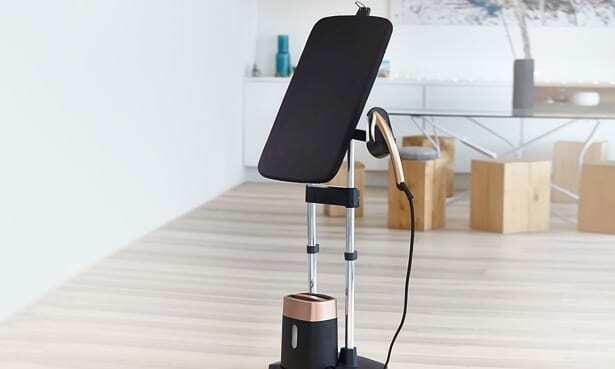 Garment steamers are perfect for freshening up once-worn, lightly creased clothes, or fabrics that have been in storage, without having to lug the ironing board out. Some are even claimed to kill odours and bacteria. Trying to get larger fabrics, such as bed linen, over an ironing board can be more effort than it’s worth. But a once-over with a steamer will do a decent job of straightening them up with half the effort. You can also use a steamer to refresh upholstery or hanging fabrics, such as curtains. While steamers have their uses, we think you’re better off with an iron if you want perfectly crease-free clothes or have big piles of crumpled laundry to do. 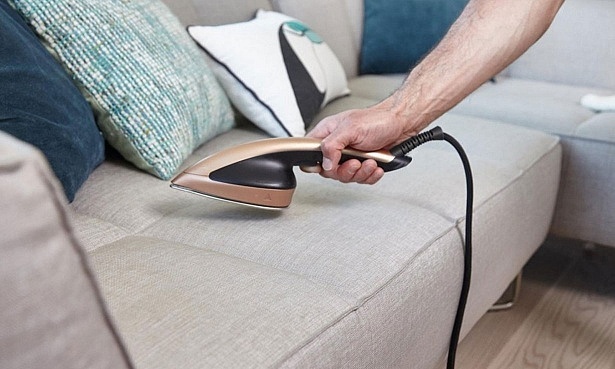 If you have the occasional bulky or delicate item to straighten out and don’t want to splash out for a separate steamer or the Tefal IXEO QT1020, some irons are more versatile than you think. Most irons now include a vertical steam function, so they can steam hanging clothes or fabrics much like a separate steamer can – although they may be heavier and less comfortable to use. It’s also worth looking out for irons and steam generators with ‘one temperature’ technology. One-temperature irons use a low enough heat to be suitable for any fabric, including delicate fabrics such as silk. As well as buying an iron that has the features you need, make sure you choose one that will make ironing quick and easy. We’ve found that even the fancier models can be slow and difficult to use, or will clog up with limescale in a matter of weeks. Head to our steam iron reviews to discover the models you can rely on to breeze through your ironing for years to come.